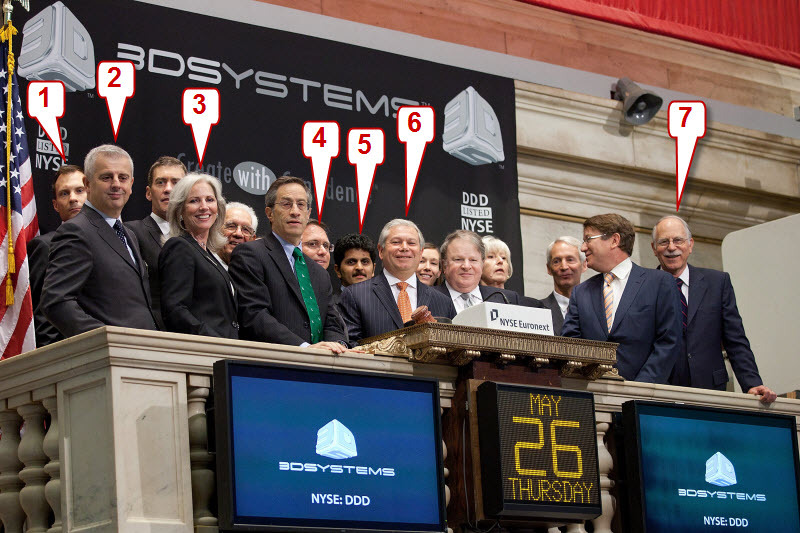 Yesterday 3D Systems rang the opening bell of the New York Stock Exchange to mark the commencement of trading of its stock under the ticker symbol DDD. 1. Andrew Johnson (Assistant General Counsel & Assistant Secretary): Expert at Microsoft Word. No, I’m serious. That’s what he seems to do all day. Sits at his computer and churns out one legal document after another. He speaks Legalese, not English. For example, if you ask him to get you a cup of coffee (I actually have) he replies, “And whereas you have expressed the desire for a cup of coffee, now therefore I will proceed to acquire the same for good and valuable consideration, the receipt and sufficiency of which you agree to acknowledge“. Andy takes active part in acquisitions. Frankly, by the time you are done with the negotiations with this guy, you will also have decided to never sell anything to 3D Systems again. 2. Michele Marchesan (VP Global 3D Printing): Met this bloke once for dinner with items 3 and 6 (below). I suspect he knows something about 3D printing, but he sure as hell knows a lot about trance music. He’s trying to find an excuse to visit Goa for just that reason. I will need to keep him clear of our beaches, unless he finds a way to 3D print sand castles and can convince kids to actually pay for that. 3. Cathy Lewis (VP Global Marketing): Works like there is no tomorrow. Literally. Doesn’t leave office before midnight. I think she doubles up as night watchman. Very good driver. She is the only company I have when it comes to alcohol. All the other 3D Systems executives drink crap like ice tea and coke. One of my missions at 3D Systems is to invent a 3D printer that prints alcohol. I am setting up a research lab in India for that. Hoping item 4 (below) will fund me adequately. 4. Damon Gregoire (SVP & CFO): Responsible for giving me my 3D Systems nick name – GoaDaddy. Apart from money there is nothing that interests this fellow. If you want his attention talk in dollars. Also takes active part in acquisitions. Gave me a hard time. Intend to hand it back to him one day. With interest. 5. Rajeev Kulkarni (VP Golbal Engineering): One of my bosses. Cricket nut. After retirement he plans to travel the world and watch test matches. No kidding. Teaches cricket to kids in his neighborhood. Has been working with item 7 (below) for the past 18 years creating and commercializing various 3D printing technologies. Should be blamed for everything that goes wrong. And right. 6. Abe Reichental (President & CEO): My other boss. Travels economy class. Ruined my chances of traveling business class. Takes part in acquisitions. Plays the good guy. The bad guys being items 1 and 4 (above). Visionary. Shrewd. Should be blamed for the transformation of 3D Systems. Inherited a mess when he took over 3D Systems years ago and turned it around. Hasn’t stopped turning. 7. Chuck Hull (VP and CTO): The man who started all this in the first place. Invented 3D printing 25 years ago and started this industry. Still invents stuff in his lab. I am told the man can’t sit idle. Met him once for a couple of minutes. Pretty sure he does not remember me. Hope to interview him one day.